After clicking OK to dismiss the error message, the application typically continues to run and function normally without crashing. However, if the process has a dependency on the Microsoft C Runtime Library version 9, the process may crash. This error message occurs when the application encounters duplicate copies of the Microsoft C Runtime Library version 9, msvcr90.dll. The duplicate copy is typically exposed to the application when a folder with a copy of msvcr90.dll exists in the PATH environment variable. Viewing maps or layers with Python labeling expressions, opening the Python window, and working with geoprocessing tools can all cause Python to load, which can trigger loading the incorrect Microsoft C Runtime Library version 9, msvcr90.dll. The msvcr90.dll C runtime library is installed and used by many third-party programs. If their install and configuration adds the program’s folder to the PATH environment variable, the machine can trigger this issue in ArcGIS. Cases reported to Esri show that this configuration is sometimes seen with two widely used software packages: LANDesk (C:\Program Files (x86)\LANDesk\Shared Files) and the Intel Management Engine’s iCLS component (C:\Program Files (x86)\Intel\iCLS Client\). This ensures that the correct msvcr90.dll is loaded by the Engine application. Compile and test the application. Esri does not recommend workarounds that involve modifying the PATH environment variable or deleting msvcr90.dll from folders listed in the PATH, as doing either can negatively impact any application reliant on the DLL. 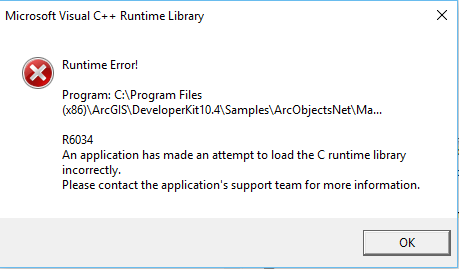 Problem: ArcGIS 10.4 applications return a "Runtime Error R6034"